1) What are dermal fillers made of? 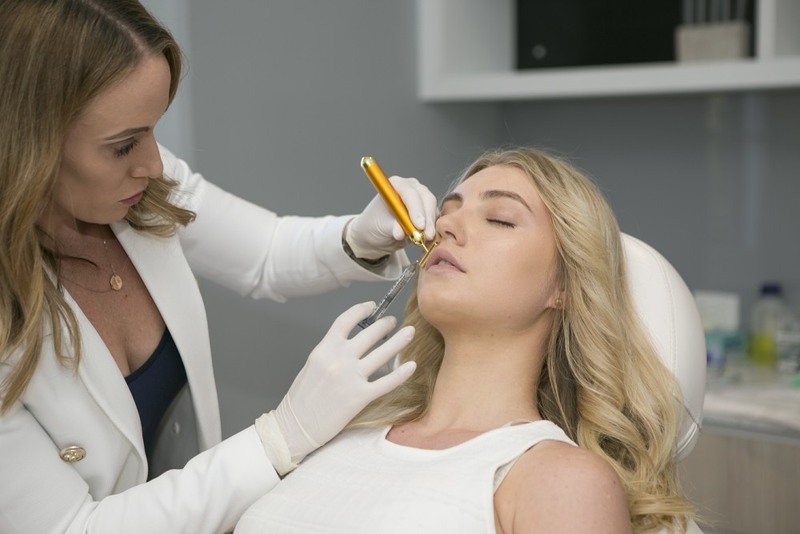 The most popular dermal fillers used today contain a naturally occurring gel like substance, classified as a glycosaminoglycan, which is found within our skin and connective tissues. Due to strict Australian regulations we are unable to name this product however it is also a common ingredient in skin care due to its strong hydrating ability and has been used in medicine for many years, primarily injected into the joints, eyes and in soft tissue augmentation. The skin consists of an abundance of this substance making it the perfect dermal filler due to its biocompatibility. These fillers are temporary and are broken down by the body over time. We no longer use dermal fillers made of collagen, silicone or ‘permanent’ fillers. The injectable gels are made in the laboratory and are altered to provide different consistencies, densities and longevity of the dermal filler. This is why there are so many available products for so many different indications in the skin. Treatments can range from restoring lost volume softening lines and folds, contouring and sculpting to replicate bone, augment the lips and hydrate the skin. When lip enhancements are discussed, the product used are also dermal fillers but can be referred to commonly as lip fillers. 2) What are the different fillers available? The scope of this post is to discuss the dermal fillers as described above. There are other types of injectable facial fillers and collagen stimulating fillers which will not be discussed here. In regards to the most popular dermal fillers there are a multitude of different types and brands available in Australia. There are a few companies with the most popular, effective and widely studied fillers (with proven results and longevity).Unfortunately due to Australian law we cannot name the individual names of these fillers. Each of these brands have many different types of filler which vary in their usages, size of the filler particles, thickness of the gel, resistance to external forces (G prime), softness and ability to integrate into the skin and tissue. Fillers vary from those designed to mimic bone to those designed to add hydration into the skin superficially. Your cosmetic doctor should be able to explain all of these characteristics to you and offer you an informed choice when it comes to your treatment. 3) Can I have dermal fillers if I am pregnant, breastfeeding or planning pregnancy? It is not recommended to have dermal fillers if you are pregnant or breastfeeding. Although the substance that dermal fillers are made of is found naturally within the body these products have not been studied in pregnant of breastfeeding women. In medicine we need to reduce risk and potential adverse outcomes, if a product has not been tested in a population group then it is best practice to avoid treatment in this group. Even some of our dermal therapy treatments such as the Hydrafacial or high strength peels are not tested in this population group, therefore are also not recommended. We do not know if dermal fillers are absorbed into the bloodstream or excreted in breast milk but generally we do not take any chances. Although the risk appears to be very low, pregnancy and motherhood is often a time to focus on maintaining skin health, nutrition and rest rather than more invasive treatments. The physiological changes associated with pregnancy such as oedema (swelling), increased blood supply and metabolism changes may also affect the behaviour of the dermal fillers once injected. So we say no, it is best to avoid these treatments if you are pregnant or breastfeeding. However, if you are planning pregnancy then there is no reason why you cannot get your regular dermal filler treatments. 4) Who can't have dermal fillers? As mentioned above dermal fillers cannot be given to those who are pregnant or breastfeeding. As the gel used is biocompatible it is very safe with a low risk of allergic reaction. However patients with multiple allergies or allergies to any of the components in the product (such as the local anaesthetic lignocaine) need to avoid having treatment. It is best to avoid dermal fillers if you have a history of active autoimmune disease or are on immunosuppressant medication due to the risk of reacting to the filler. However it is not an absolute contraindication and many patients with lupus, rheumatoid arthritis and other autoimmune disease can safely have treatment without any adverse events. It is important to always liaise with your treating physician and cosmetic doctor about your medical history. A thorough cosmetic doctor will always work closely with the rest of your medical team. Patients who are on high dose of prescription acne medication may need to wait 6 months before they can have dermal fillers due to an increased risk of poor healing. We also do not treat anyone who is currently unwell (even with a cold) or who has been unwell, had surgery or dental work in the month prior to treatment. This is because of the increased risk of infection and delayed reactions. 5) What is the down time with dermal fillers? Dermal fillers have very minimal down time. It is important to remember that the treatment is a medical procedure so there are expected ‘side effects’. In general dermal fillers are relatively pain free (this is helped by the use of local anaesthetic with in the filler and the use of topical anaesthetics and nerve blocks). Pain should be temporary but many have some tenderness and discomfort in the area of treatment for a few days. This can be treated with simple pain relief such as paracetamol. Swelling and redness is expected. Swelling often peaks at 24-48 hours but can persist on a lesser scale for a few weeks. It can take a few weeks (generally 4) for the filler to fully settle into the skin which is why doctors will not do a ‘top up’ treatment before this has occurred. Swelling can also result in some asymmetry which will settle with time. Swelling can be managed by cool compress, avoidance of heavy exercise and antihistamines and occasionally steroids in severe cases. The main factor causing down time is bruising. This is expected with any treatment using a needle into the skin. The skin has a vast supply of arteries, veins and capillaries and even the most skilled injector can cause a bruise. A haematoma is a large bruise and clot under the skin which will look swollen and blue/black. Bruising will be discussed further below. 6) What are the risks of dermal fillers? Dermal fillers are considered very safe however there are some very important risks that every patient needs to be aware of. If your doctor does not consent you for these risks then they are not informing you of every possible outcome. The most serious risk with dermal fillers is the risk of injecting into a blood vessel such as an artery or vein. As dermal fillers are a viscous gel they can act to occlude the vessel and prevent the flow of blood. This can result in decreased perfusion to target tissues such as the skin and result in skin death or necrosis due to a lack of blood supply, There have also been cases of blindness resulting from dermal fillers due to the gel traveling to smaller arteries like the retinal artery which supplies the eye. High risk areas for this complication are the glabellar (frown area), nose, nasolabial folds and tear troughs. There has been two reported cases in Australia in 2018. Even the most experienced cosmetic doctors would have had intravascular injection as a complication before. However in the right hands this is managed immediately with dissolving the filler and appropriate treatment. Another reason why it is essential to go to a medical clinic for your treatment. Other risks include infection such as cold sores in those who have the HPV virus and rarely bacterial infection. There is a small risk of nodule formation and granuloma formation which is a delayed inflammatory reaction to the dermal filler. In cases like this it often occurs many months after treatment, but can be treated with antibiotics, steroids and occasionally removal of the product. 7) Who can inject dermal fillers? In Australia, dermal fillers can only be injected by doctors and nurses. However there is absolutely no regulation around the training that is provided to the doctors and nurses in order for them to provide dermal fillers as a treatment (this is the same as with anti-wrinkle injections and laser). For example, a doctor can attend a two hour training session with the company that supplies the products, set up an account and start injecting. There is no minimum requirement in regards to knowledge of the various products, no testing on anatomy knowledge nor an assessment on how to manage complications. Many nurses also get away with injecting dermal fillers by simply having a Skype consultation with the doctor before treating a patient. A 30 second video call is not a sufficient medium for a consultation and is unsafe and unethical. I would urge all who are considering having a cosmetic treatment with dermal fillers to thoroughly research the doctor or nurse who is injecting you. Ensure they have experience, work FULL time in cosmetics, have adequate insurance, are members of professional regulatory bodies and have the facilities to manage complications if they were to occur. 8) Why are these such price discrepancies with dermal fillers and different clinics? There are two main groups of clinics providing cosmetic injectables. The 'cut price' clinics offering specials, Scoopon deals, seeing multiple patients per hour and providing little to no aftercare or support; versus the higher end clinic with higher prices, a focus on patient safety and care with highly trained staff. It is a race to the bottom in the cosmetic industry due to the amount of competition, with many clinics feeling they have to cut prices to get patients through the door. I am a firm believer that you get what you pay for. Generally the products used are very similar, often the same brand, but clinics will cut the costs of the product in order to bring more patients through the door. This of course minimises their profit margin which is why they need to see many more patients (rushing a procedure is a recipe for disaster). At these lower priced clinics you will find you will see a nurse, with limited consultation time, only have one concern addressed and in many cases often have an unsatisfactory result. The price game gets complicated, but choosing price over quality can be a costly mistake. I urge you all to choose a doctor or a clinic that you feel comfortable with and who are willing to invest their time into getting you the best results. It is about VALUE not COST. 9) What areas can be treated with dermal fillers? Dermal fillers can be used to treat almost all areas of the face. Their use depends on the type of gel and ranges from soft products to smooth and refine the skin, volumizing products to replace lost volume and plump the lips and firmer products which are used to add structure and support. Dermal fillers can add volume and sculpt the lips and rejuvenate the mouth area, contour the cheekbones and restore lost volume in the cheeks, fill in lines and folds in the face (eg marionette lines, nasolabial folds), add support to the tear trough area and rehydrate the skin. More advanced techniques for dermal fillers include adding volume to the temple region, supporting the forehead, shaping the nose, sculpting the jawline and chin, rejuvenating the neck and hands as well as intimate procedures. The use of dermal fillers is unlimited, however having treatment in higher risk areas (as explained above) needs to be performed by an experienced and skilled injector. In the right hands dermal fillers can completely rejuvenate the face, freeze the clock and improve the quality of the skin. 10) How much is in a syringe of dermal filler? Generally a syringe of dermal filler contains 1ml of product (this is relating to the types of dermal fillers discussed throughout this article). There are a few products that contain 2ml in a syringe but this is not common. 1ml of dermal filler is not a particularly large amount when you consider that a teaspoon is 5ml! 11) How much dermal filler will I need? This is a difficult one as no two people are the same in regards to the amount of product required nor their individual concerns or expectations. The lips for example will need at least 1ml for a noticeable result, whereas the nose and tear troughs may need slightly less. When we consider cheekbone enhancement, jawline sculpting and chin enhancement, 2-3 ml may be needed initially. Even more product is required when considering global volume replacement and ‘liquid' facelifts. Often we say that 1ml of dermal filler is needed for each decade of life to give a rejuvenating and subtle result (eg a 50 year old will most likely need 6ml as a starting point). Following this regular top up treatments can be done to maintain results and further enhance the face. 12) I only want a bit of filler in my lips, can we use the rest of the syringe in my cheeks”? This is a common question from patients as they have often heard from friends that ‘the doctor put 0.5ml in my lips and then used the rest of the syringe in my cheeks’. Generally this is an inappropriate use of dermal fillers. As mentioned above the characteristics of the different dermal filler gels vary quite significantly. The fillers used in the lips are preferred as they attract water, hydrate and add volume while integrating smoothly into the natural lips. Fillers used for cheekbone enhancement are generally much thicker and firmer gels which work to project the cheek and often mimic bone to give back structure and support. A thick, firm filler in the lip is often a disaster in the wrong hands, and a soft hydrating filler which looks great in the lips will simply be lost when placed in the cheeks. At the end of the day it is a waste of precious product to simply ‘place the leftover filler in the cheeks’. A skilled injector will explain the characteristics of the filler they are using and when there is ‘leftover’ filler (which is hardly ever the case when planning treatments appropriately) choose an appropriate region to inject to offer the best results for the right indication. This will usually be in the perioral area (around the mouth), to add support and to enhance the lips. 13) How can dermal fillers be removed if there is a complication? Unfortunately there may be complications with dermal fillers, as explained previously. However with those dermal fillers that contain naturally occurring gels there is the possibility of reversing and dissolving the dermal filler. This is where these types of dermal fillers have advantages over those where there is no possibility to dissolve them. By using an enzyme called hyaluronidase the dermal filler can be completely dissolved in case of a complication. Hyaluronidase, or Hyalase, completely removes the gel and breaks it down. In the case of injection of a dermal filler into a blood vessel, this can be treated immediately with Hyalase, preventing long term complications such as skin death. In the case of unsatisfactory results, lumps, nodules or overfilled areas then Hyalase can be injected to correct the area prior to re-treatment. This is a common occurrence especially with lip dermal fillers from untrained practitioners. Hyalase is not without its own risks as there is a small possibility of an allergic reaction. The treatment can be uncomfortable and often multiple treatments may be required to fully dissolve the filler. 14) Why can’t the names of dermal fillers be mentioned in advertising? Unfortunately we are unable to name dermal fillers in advertising. In Australia, strict laws prevent the advertising of prescription medications. As dermal fillers and wrinkle relaxers are prescription medications we cannot advertise them. This even extends to the ingredients of the dermal fillers which is why navigating the available options can be very confusing for the consumer. We are only able to advertise dermal fillers as ‘dermal fillers’. The two main companies that produce dermal fillers in Australia are Allergan and Galderma, they are the industry leaders and produce two of the world's most popular brands of filler. Simply Google them and the names will come up. Within each of these ranges of filler are numerous fillers of difference characteristics and names. Again it is extremely frustrating and confusing that we cannot use these names in any form. Any clinic that uses brand names of these products is essentially breaking the law in Australia. The best thing for any potential patient to do is simply contact their preferred doctor or clinic and arrange a consultation. Here the different fillers will be explained and the correct treatment recommended. 15) Should I research my doctor? ABSOLUTELY! As mentioned previously there is no regulation surrounding training for doctors in Australia. Word of mouth is extremely important, so ask friends and family about their experiences. The internet can be confusing, and as doctors cannot advertise testimonials on their websites (again another Australian law), it is hard to gauge how popular they really are. Social media is often a good way to interact directly with doctors and clinics, with Instagram being a great platform to showcase a doctors portfolio. However it is important to remember that the majority of their work will not be published online due to patient confidentiality and privacy and often social media images are not true to life. I would suggest arranging a consultation prior to booking in any treatment. That way you can meet your doctor, establish a therapeutic relationship and ensure you trust them to look after you. Ask to see before and after photographs. A good physician will not pressure you to have a treatment on the day, answer any questions without judgement and recommend alternative procedures if necessary. 16) Does bruising affect the end result? Bruising is one of the most common effects from dermal fillers and can vary from person to person. It is sometimes impossible to avoid bruising, especially with lip injections as this area is extremely vascular and well supplied by a network of tiny blood vessels. Injecting a needle into the skin in any area of the face can result in a bruise despite the good intentions and skill of the injector. Using a blunt ended cannula can help to reduce bruising but there are some treatments that may necessitate a sharp needle to allow for precision injecting, and also the injectors preference. A bruise can be prevented by avoiding alcohol (preferably 7 days prior to treatment and 7 days post treatment) and medications that may thin the blood such as aspirin, ibuprofen and fish oil. Ensuring you follow your aftercare advice provided by the doctor is also essential. Applying cool compress, no exercise and no alcohol is essential to prevent and lessen bruising. You can read my post on dermal filler after care here. If you do get a bruise this can often look frightening and will get worse before it gets better. Rest assured a bruise will only last 5-7 days, and in the case of a haematoma (collection of blood under the skin) 2 weeks. This can be managed with ice, topical creams such as arnica and hirudoid and LED light therapy treatments in severe cases. A bruise may be unsightly but is no reason to panic. It will NOT affect the final result of treatment and is only a transient side effect. It is a consented risk and one that must be anticipated with any cosmetic treatment. Once the bruise slowly fades naturally the treatment will be settled and not affected in any way. 17) Should my doctor be using a needle or cannula during my treatment? As mentioned above a cannula can often cause less trauma and less risk of bruising than a sharp needle.Both have their place in the injection of dermal fillers. Generally doctors will learn to inject dermal fillers with a sharp needle, and as they become more experienced and confident will progress to using a cannula. However there are certain areas of the face and certain treatment where one is preferred over the other. In high risk areas such as the nose, tear trough and nasolabial folds a cannula is generally considered safer as there is a lower risk of injecting directly into a blood vessel. There is still a risk though, even in the most experienced hands. In certain treatments such as lip enhancement where precision is required many doctors prefer using a needle as this allows very precise placement of dermal filler, and a chance to sculpt and define the lips. There may be an increased risk of bruising but with this often comes a better end result. Many doctors have their preferences for certain treatments and also certain products (for example a thicker dermal filler may be easier to inject with a larger cannula). A good cosmetic doctor will explain their reasoning to you regarding their use of a needle or cannula. Interestingly trends around the word regarding the needle versus cannula debate also vary. 18) Why should i avoid only having 0.5ml? Simply because you will come back in 4 weeks to your doctor requesting more! 0.5ml may sound like a nice introduction into dermal fillers (such as lip enhancement) but often once the initial swelling goes down the result may not be evident. 0.5ml is the equivalent volume to 1/10th of a teaspoon. Dermal fillers also only come in 1ml syringes as a minimum so this may create product wastage and issues with hygiene and infection control if your practitioner then uses the product on another patient. This is not best practice and your practitioner will not be covered by their insurance if an adverse event were to occur as dermal fillers are made for single patient use. From a personal perspective my preference is to use 1ml as a minimum (there is always areas where remaining product can be injected). This ensures the best possible result, minimises any infection risk and reduces the need for another treatment soon after (which in turn means less downtime and risk of complications). .
19) Can I share a syringe of filler with my friend? As explained in the previous question, no. It is possible to decant dermal filler into two separate syringes for treating two different people however this is not best practice and a big no in my opinion. There is a small risk of infection with this technique. As explained previously sharing a syringe of dermal filler of 0.5ml each will not give optimal results overall. 20) My lips are asymmetrical after lip fillers - Should I get them fixed? Maybe. Generally after lip fillers the swelling can be quite unpredictable. One side of the lip may become more swollen than the other for example. The top lip also tends to swell a little bit more than the bottom. Occasionally after lip dermal fillers there may even be a bruise under the skin causing a haematoma which can appear as an enlarged and swollen area. Asymmetrical swelling is very normal and usually settles as the dermal filler settles into the lips and the skin heals. It is important not to panic at this early stage. If there is still asymmetry after 3-4 weeks then see your injector as more filler may be required. In the majority of cases, if the lips have been injected correctly and natural lip asymmetries have been accounted for and corrected, then the lips will heal in a natural looking way. Patience is key, a good cosmetic doctor will not retreat the lips to early as this may in fact cause asymmetry down the line (by adding extra product when it is not needed). 21) Can I have dermal fillers if I have had surgery or other cosmetic procedures? Absolutely! Dermal fillers can be injected both before and after facial cosmetic surgery. Dermal fillers can also be combined with non-surgical procedures such as thread lifts and wrinkle relaxers to enhance the results. It is always best to consult with your doctor if you are considering dermal fillers and have had facial surgery such as repair of broken bones, insertion of metal plates or extensive dental work. Dermal fillers should not be injected into areas of the face where permanent fillers have been injected previously. 22) How soon after dermal fillers can I have skin treatments done? It is important to wait at least 2 weeks, preferably 4 weeks following dermal fillers to have any skin treatments performed such as chemical peels, BBL/IPL/laser, skin needling or facials. This is to ensure that the skin has healed adequately and to decrease the risk of complications such as infection. Like most cosmetic procedures, results will be improved with a combination of modalities such as dermal fillers, anti-wrinkle injections and dermal treatments, however timing of these procedures should be discussed with your treating doctor and therapist.